I need my avid readers to enlighten me - "masterpiece" I read in the reviews. I must have been sleep reading (or just a big dummy), but I am not going to re-read this book to try and find the masterpiece inside. If you have read it, please talk to me and tell me about it. Haven't read it, the word "masterpiece" is often misused. I think you're right Terra. It used to mean more than it does now. I think. Not one I know, but a blogger who I respect really likes the author's work. I never read THE REMAINS OF THE DAY, but love that title and the movie. That is what I've found out since I started reading fiction again. I've also been known to fall for a cover. Just heard so much about this one and had high hopes and want to know what I missed. I have not read it either. But looked it up on Amazon. I know nothing of the author, except that he is Japanese. A Grand Daughter has become immersed in the Japanese culture, studying Japanese in university and going there to work. It is a very, very, very different culture, from our own. Wondering if this, could be the reason, that this particular book, is not very straightforward? I read a Murakami book last year and was disappointed in it too. I rate books by whether I can finish them or not, in which my batting average is pretty low though I did finish them both. I end up on the last page too often thinking is that all there is? I too love the Japanese and their culture - I am very interested in it. The Murakami book was set in today's Japan, but the Ishiguro book was in post King Arthur days in Britain. Oh well...all I know is I can't pick em especially by the book reviews. I find that for me, reading a translation of a Japanese book is very hard and not quite understandable. Even Son who is a professor at University there still cannot quite tell me what something says because he can not translate the correct syntax ( ?) or feeling of that word. Not that this is what you are saying. But maybe it is a book better read and understood in Japanese. Or it is just not a "masterpiece". I have bought many Japanese books just for their covers. I don't read Japanese. The only family member who doesn't. I can't remember the Murakami title. I think I posted about it once. Really, the problem is I just can't pick them. I'll type it in the top left and see if it pops up. I think all our reading tastes differ don't you Donna? I also think there is a great deal of snobbery about calling a book which is difficult to read a 'masterpiece'. Yes Pat, which makes it hard to find one I like. I did like CIDER WITH ROSIE, which you kindly recommended. It is funny about the Giant book. I felt like it was an adult Grimm's fairytale, told in simple prose, but couldn't find the masterpiece. The story isn't as important if the writing is lyrical and beautiful (like Rosie.) Guess I want a book to have it all. I need to be in a reading club. 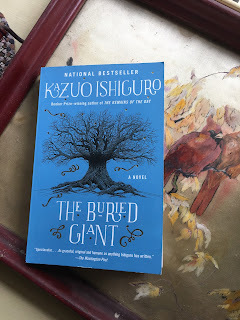 Dear Donna, I am a fan of Ishiguro's writing and was looking forward to reading this book, thinking that it was going to incorporate mythology, history, nature and have some sort of timeless quality. I was disappointed, and almost returned it to the library before reaching the last page. Instead, I pressed on like the characters in the book, and began to wonder increasingly about the journeys we were on. If you've not read any of his other books, don't let the Giant put you off. I was also disappointed in David Mitchell's most recent book, and he is another of my favorite writers. Thank you Frances. Was the point that perhaps it's better not to remember certain things in life and like the gingerbread man that rode on the fox's back, he was still a fox (boatman.) Going back to read the earlier part about the boatman and then the last part again. I read in bed at night and really think I must have sleepread cause I sure missed something. Maybe if you have a minute, you could email me your thoughts. Have a great one, Donna. I SAW Remains of the day..I really liked it if my memory serves me well.. I just read The Lilac Girls..I liked it..
You too Monique. I am finally sorting out my art room and framing a few prints to sell in my booth. Progress. I like that. His 'Remains of the Day' was my favorite book of his - and much of the movie was shot near my home in England. 'Never Let Me Go' was strange, didn't really get into the book and the movie was incredibly odd and unnerving to me. He is a great writer but chooses peculiar subjects - or perhaps I'm peculiar in that I find them a hard read! Love the title and movie ROTD. The BG book was written like an adult Grimm's fairytale and I just didn't get it. I've just started a Kate Atkinson book and her other books I've read were confusing. But, I'll go on as I know she is a good writer and storyteller. I've kind of given up on my ability to select a book.